Zoolax Nights is a point-click survival game. It has huge similarity with the Five Nights At Freddy’s games. As in FNAF games in Zoolax Nights: Evil Clowns you need to survive 6 nights to win. Each night will be more scarier and more difficult than previous night. 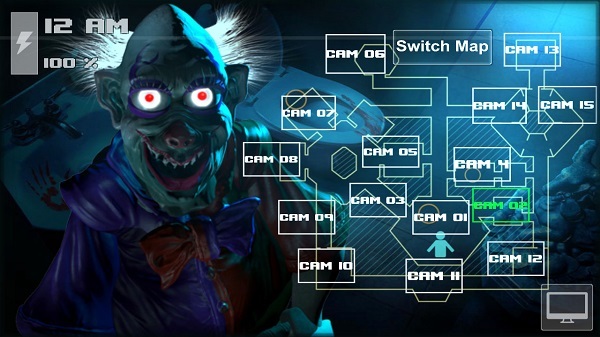 A lot of deformed clowns and animatronics will try to reach the room from where you are controlling. If they manage to go inside of your room and if they found you you will die. Be careful and give your best to survive these 6 nights at Zoolax Inc place until 6AM. This game is played by using your mouse. Pointing in different options and clicking on them to activate them. On the beginning of this online Zoolax Night game you will hear audio being played in the background. You can choose to skip that audio or to listen to it. you to listen to the audio track because it will explain everything that you need to know to survive. Step by step. On the left side of your screen you will see one door from where evil clowns can get to you. On the right side of your screen you will see another door. In the middle of the map will be a hole from where those creatures can also get. Next to the whole you will see a fountain. Evil clowns can also come from there but there is a way to stop them. In the lower corner of your screen you will see a button and the image of a fountain on it. If you click on it the water will start to rise. That will prevent those animatronics from coming from that side. Keep mind that having fountain working will consume your battery power. If you use all power from the battery before the night ends, you will be completely unprotected. If you click on the icon that is in the right corner of your screen you will open a new window. That will show you number of cameras that are observing number of rooms. Checking each room, will give you information about the evil clowns movements. Your main goal is to stop them from entering your room. You have 22 cameras that you need to watch over, meaning that there is 22 rooms. Some of them are vents that you also need to watch over. Animatronics can come from there as well. There will also be a mini puzzle game with a picture of a scary clown on it. From time to time you will hear an alarm. that alarm will mean that you need to solve that puzzle as fast as possible. To solve the puzzle you need to put the pieces of the picture on the right place. Do it as fast as possible. You can also use a red light button that will flash and scare anything that is close the the door in the middle of the room. If there is animatronic that is very close to your room and there is no way that you can stop it in that certain moment. Then you should hide under your desk for couple of seconds until the evil clown go away. The main goal is to survive. you can’t kill those clown but you can save your life. Every next night that you need to survive as security guy will be more scarier. And much harder than previous one. You need to react fast. You need to have good observations skills and you need to solve those puzzles fast. All that is necessary if you want to survive those 6 nights. If you don’t understand the rules of the this unblocked Evil Clowns game you can also click on the “Guide”. Icon that is on your screen and there you can read everything that you need to know. During the night some tiles in cameras will break and you will need to fix them as fast as possible. Camera that you need to pay good attention is camera 15. If you lose the track of any clown will make them more aggressive, so keep close attention on them. If you want to check the hallway you need to press the desk’s red button on your screen. Also watch the sewer holes in front of you. 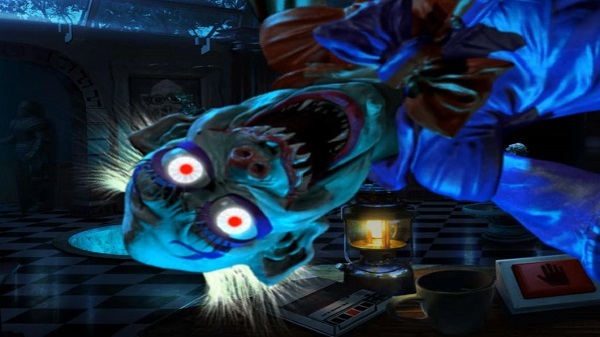 Zoolax Nights: Evil Clowns is well done game. 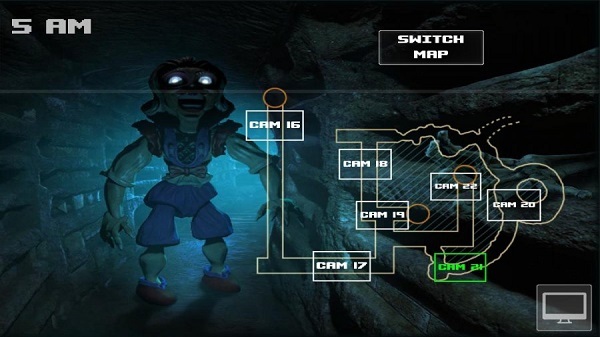 Concept of the game is same as in unblocked fnaf games. There you also need to survive certain amount of nights while avoiding creatures. The only difference in this online Evil Clowns game is that you have far more cameras. More puzzles to solve, more things that you need to pay good attention on. Jumpscares will came in many different shapes, forms and they will be loud and scary if you make a mistake. Prove how good guard you are in this challenging point-click game. Show what you learn by playing FNAF and Sister Location games. Survive those Evil Clowns! Copyright © Five nights at Freddy's 3 - Free online fnaf game. All rights reserved.